Today we had our first serious day on site for a long time, with our staff supplemented by newly arrived volunteers who had responded to our call for more labour. The site really felt like an archaeological excvavation, and morale was boosted by the visits of Professors Lisa Fentress and Janet Delaine, who were able to share many stratigraphic observations with us. Work on the facade is now almost finished, and attention has focused on re-digging an old excavation trench which cuts through the facade and which may provide us with a valuable section through the layers here. The cleaning of the facade has revealed a number of new layers, including a destruction layer which apparently overlies the earliest Trajanic phase of the floor and may give a TPQ date for the building of the facade in its final form. A well-cut inscription came out this layer and is being identified. 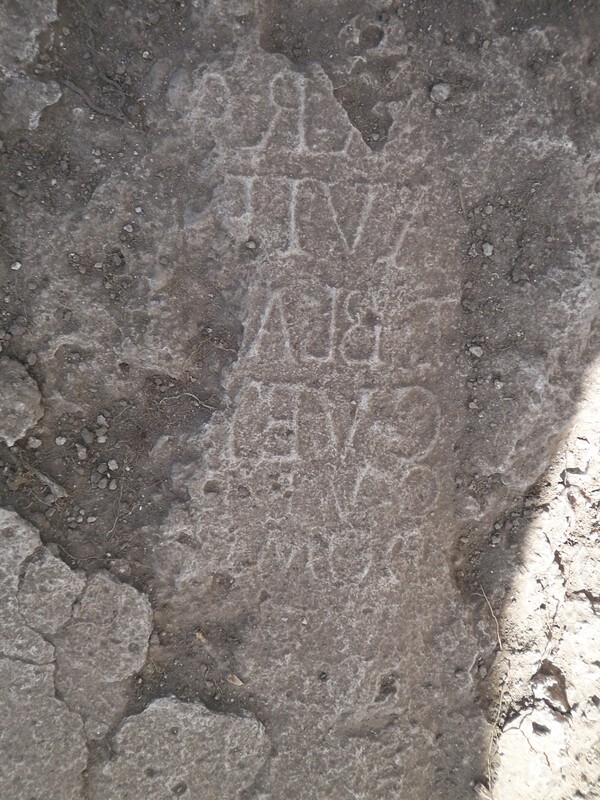 Elsewhere on site inscriptions are becoming more comon as parts of the paving are being removed. Such thin inscribed pieces were popularly reused as veneers and paving slabs, and many more likely to have been used, with their inscribed faces down , as Late Roman architects sought to create a paving surface reusing the epigraphic monuments of a previous and perhaps forgotten generation. The re-used material or ‘spolia’ is likely to become a key focus of the project. Today Richard Sadler began to survey the spolia around the forum with some interesting results. We hope to use infomation from the nature of the reuse of stonework to try to phase and date different walls, which often contain similar pieces, suggesting that they were laid down at a similar moment in time. The weather on site has cooled considerably, with the mornings now starting quite cold. Everyone is now a bit more cheerful, now that the memory of moving campsite is beginning to fade, and we are now eating the excellent food of Shelagh French, Luke’s aunt who has arrived to manage logistics for a week. The sun continues to shine, though now with an autumn glow, and we are starting to eat grapes rather than peaches with our lunch. No-one now is talking of going home and more volunteers are due on site today.